Most people fly to Anguilla via San Juan Puerto Rico on American Airlines and American Eagle. The second most common way to get to Anguilla is to first fly to Dutch St Maarten's big International airport. From there you can either take a 5 minute connecting flight to Anguilla, or take a taxi and then the ferry to Anguilla. 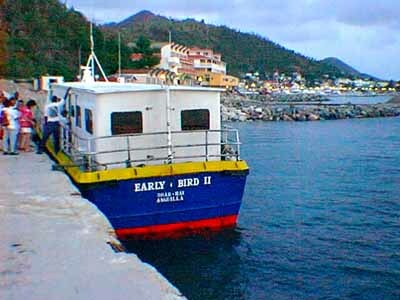 The ferries (the one shown at right is in French St Martin) run every half hour during the day and costs $10 US. The phone number at the Anguillian ferry terminal is 6853.